In a bombshell revelation that left the White House deeply rattled, President Donald Trump’s eldest son admitted this week that he met with a Kremlin-linked lawyer last year after being promised she had “very high-level and sensitive information” that would “incriminate” Hillary Clinton. Donald Trump Jr. was told in an email by British publicist Rob Goldstone, an intermediary he knew from his father’s Miss Universe pageant in Moscow, that the proposal was “part of Russia and its government’s support” for his father. 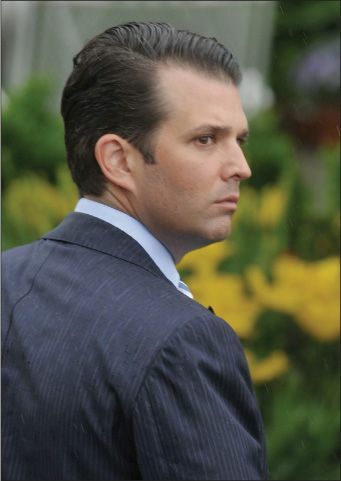 “If it’s what you say,” Trump Jr. replied, “I love it.” He forwarded the email chain to his brother-in-law, Jared Kushner, and his father’s campaign manager, Paul Manafort; all three men met the lawyer, Natalia Veselnitskaya, in Trump Tower on June 9, 2016. The Trump Jr. revelations came just days after President Trump’s first face-to-face meeting with Russian President Vladimir Putin, on the sidelines of the G-20 summit in Hamburg. After the two-hour conversation, Putin said Trump had accepted his assurances that there was no Russian meddling in the election. The White House disputed that account, saying Trump had “strongly pressed” Putin on the issue, but agreed that it was “time to move forward.” Trump also said he and Putin made important progress on a cease-fire in Syria, and that they were planning to jointly set up “an impenetrable Cyber Security Unit”—a claim he later dropped amid widespread ridicule. The Trump Jr. emails “confirm what the president, his son, and others have denied repeatedly for more than a year,” said The New York Times: Trump campaign officials met with Russian government representatives to solicit help in winning the election. “Any halfway competent and ethical campaign” would have taken a foreign government’s offer to influence a U.S. election straight to the FBI. Instead, Trump Jr., Manafort, and Kushner pounced on it. Now Trump Jr. “appears to be in real legal jeopardy” for violating campaignlaw prohibitions on soliciting any “thing of value” from foreign officials. U.S. intelligence agencies told us that “Putin’s goal was to get Trump in the White House,” said Cristian Farias in NYMag.com, but for the first time, we have clear evidence—“a smoking gun”—of improper connections between Russia and Trump’s inner circle. This revelation may point to wrongdoing that “could very well reach the president himself,” who began publicly inviting Russia to find and publish Clinton’s emails right after his son’s meeting. Is it really credible that Trump’s son, son-in-law, and campaign manager were told that the Russian government wanted to give Trump information to help him beat Clinton, and never mentioned it to the candidate? Sorry, but this is a “faux scandal,” said Ed Rogers in Washington Post.com. “There are always people hovering around campaigns trying to peddle information.” Trump Jr. was foolish to take the meeting—he should have sent a “lackey”—but since “nothing happened,” no collusion occurred. If, as Trump defenders insist, the Trump-Russia connection is all a big nothingburger, said Matthew Yglesias in Vox.com, why does Trump keep acting as if Putin is his favorite world leader? Virtually everyone else in Congress and Trump’s Cabinet sees Putin as a dangerous foe who interfered in our election, but the president remains firmly “attached to the idea of a Russia-friendly foreign policy.” Why?